Interested in becoming a member? 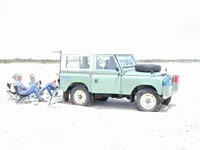 Membership in our Land Rover club is open to all owners and enthusiasts. 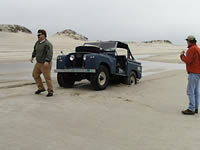 We are a group of Land Rover devotees that have been coming together and holding events for 20+ years. The club is informal and loosely based around the events we put on each year. There is no board of directors or bylaws. 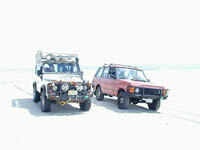 The value in the club is our events and the social aspect of these gatherings. We collect yearly dues for the club, but this money is used to buy shirts, hats, stickers, prizes, etc for the events. You can easily earn your dues back each year in event prizes. All of our events are family friendly. This is a yearly subscription and PayPal will automatically draw $25 from your account every year on the date you sign up. You may cancel at any time via PayPal. For signing up you will receive a t-shirt and a pack of stickers. After you sign up, watch for an email from us asking for your shirt size and these items will be mailed to you. Held in Robesonia, PA, just outside Reading, PA. Trials events are a skill based event where you attempt to navigate your truck through a series of gates in each section. Gates are numbered in descending order and the object is to get through without touching them. Lowest score wins! The property is rocky, hilly and with mature trees. The course is laid out with challenge in mind, not carnage and some bypasses do exist. Friday night is set up. Sunday is camp break down. There will be prizes in all the categories and a raffle at the end of the event. For the last two years ROVERSClub has co-sponsored with Alloy+Grit to provide a club tent at the Carlisle Import & Performance Nationals car show weekend in Carlisle, PA in May. Quickly becoming of one of our new favorite annual events. Bill has been working very hard to build trails on his property and has created an impressive network throughout. This event is free and held in Blairstown, NJ. You can arrive anytime. We will be hanging out throughout the morning, and the trails are immediately across the street so wheeling can occur at any time. A cookout is provided with trail riding and socializing at your discretion. Camping is available if anyone is interested in staying for two days. Same as the spring event, but in the fall. 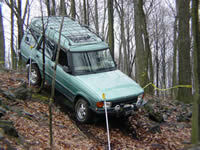 In the winter the club heads to the Poconos to a private 1,600 acre hunting camp for snow off-roading. This event is VERY popular and limited to about 20 people (the # of bunks in the cabin), so it fills fast. Typically the group meets on a Friday night at a local restaurant, then heads into the camp. We go in as a group and come out as a group because the cabin is behind a locked gate. 6. Informally throughout the year club members will plan outings to Rausch Creek Offroad Park, Anthracite Outdoor Adventure Area (AOAA), the state forests of PA, Bill�s property in NJ, etc. Check the sources below for these impromptu events. https://www.facebook.com/PArovers/ Our main page on FaceBook. You do not need a FB account to see this page. 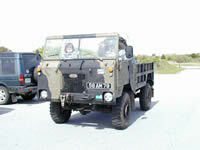 http://roversclub.org The front page of our website typically is updated with information about the events and when they will be held. Email List - Events are also communicated via the email list. If you would like to be added the email list, contact us here. If you sign up for a membership you will be automatically signed up for the email list. Annual ROVERS Club Membership. Due to many many requests, this will automatically rebill you each year. You can cancel at any time.